I was giddy like . . . a giddy person on Sunday, waiting for 9 pm. I swear that watching GoT is the fastest hour of my week; I feel like an ep has just started, and then bam—time for the closing credits already. I also feel like I just watched the premiere of Season 3 (and not only because I re-watched it over the weekend during the GoT marathon). Seriously—I'm trying to figure out where the last year has gone . . . .
Every detail of this show is so meticulously plotted out, including the compilation of clips that are shown before the beginning of every episode. It really pays to take careful notice of them because they provide major clues to what's going to go down in the next hour. And here we go with Season 4! We see two swords being forged, and then Lord Tywin's intimidating mug. Guess where the Valyrian steel for those swords came from? That's right—Lord Tywin had Ned Stark's sword, Ice, melted down and remade into two blades. One is for that waste of space, Joffrey, and the other is for . . . .
Who's in Lord Tywin's Office This Week? It's Jaime! Just about everyone else in King's Landing has had a têtê-à-têtê with Lord Tywin, including both of Jaime's siblings, so why not Jaime? I gotta say, I was really digging the beard and long hair from Seasons 2 and 3, but I'm not gonna complain about his short hair/clean-shaven look. :D What was I saying? Oh, right—Jaime's daddy has basically berated everyone in the family, so this week, it was Jaime's turn because he won't quit the Kingsguard and rule Casterly Rock like a good son. Tyrion, Bronn, and Pod are hanging around waiting for the arrival of their Dornish guests, in King's Landing for the upcoming wedding of Joffrey and Margaery. Surprise—it's not Prince Doran Martell who turns up but his younger brother, Oberyn, who has no love for the Lannisters. Expect lots of trouble (and fun!) from this guy. Oh my, how the dragons have grown! I remember when those three were tiny and could barely breathe fire. Now look at them—I don't think they quite fit on Daenerys's shoulder anymore. Sansa, devastated over the deaths of her brother and mother, just wants to be alone. Tyrion is very sweet to her, but really, she can't stand the sight of any Lannister right now. Meanwhile, Shae wants to spend some quality time with Tyrion, but he's worried someone will find out about her connection to him, which will make her a target. As we see at the end of that scene, he's totally justified in thinking this. I really wanted Jaime to just whack her over the head or something with his golden hand because of the way she was whining. Apparently she's mad at him for leaving her all alone and not returning to King's Landing sooner because he was too busy being a captive and getting his hand cut off and all that. You know, not a legitimate excuse at all for not being by his sister's side. We catch up with Ygritte, Tormund Giantsbane, and some of their Wildling cohorts. Some other scary-looking Wildlings, the Thenns, turn up, and it turns out that they have a little thing for cannibalism. Eeewwwww! Jon is back at Castle Black and finds himself before a panel of the Night's Watch to discuss his recent adventures with the Wildlings. Alliser Thorne, the guy who tormented him in Season 1, is back and gleefully ready to have him executed for breaking his vows. Another face from the past is Janos Slynt, former commander of the City Watch who got a demotion and exile to the Wall when Tyrion named Bronn to the post. Maester Aemon, however, isn't part of Team Kill Jon Snow, and so Jon survives the day. 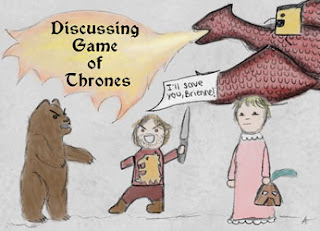 I can't even discuss that revolting statue of Joffrey. This kid needs to die. And just because he can, he rags on Jaime for a bit, noting that Jaime's page in the history book that records every Lord Commander of the Kingsguard is empty. I repeat: Joffrey. Needs. To. Die. Lady Olenna and Margaery are consulting over jewelry when Brienne (yay!) asks to speak to Margaery. Brienne recounts Renly's death by Stannis's evil shadow (I'm STILL traumatized by the "birth" of that thing). Brienne later has a snappy exchange with Jaime; when are those two going to realize that they belong together? When, when, when, when?! Remember Ser Dontos Hollard, the knight whom Sansa saved by suggesting Joffrey keep him alive as a fool? Well, here he is, and he's so grateful to Sansa that he presents her with a necklace. "Hmmm," says my Inner Conspiracy Theorist. Daenerys and her crew are on their way to their next stop, Meereen. Will they ever get there? Maybe by the end of the season. Hey—did you spot the new Daario Naharis? Yup; there's a new one. Since I didn't care for Daario in the books, I can't really say the recast has been earth-shattering or anything. What the F**k's a Lommy? Remember Lommy Greenhands? The kid who was part of Arya's little group along with Hot Pie? That's who the f**k Lommy was. Well, Arya and her new BFF, the Hound, make a pit stop where they run into none other than Polliver, the very man who killed Lommy and stole Needle from Arya. Everyone plays it pretty cool until the Hound is all like, "F**k Joffrey! I want some chicken!" and chaos ensues. Arya, with a stone-cold expression on her face, delivers the killing blow to Polliver. One more name off the list! And she has Needle back! And a horse of her own! It's time for another wedding! Will this one be bloodshed-free? It's Game of Thrones; what do you think?! I hadn't put too much thought into the necklace that Sansa got, but now that you mention it and I'm guessing it's going to play some kind of important role in the future. Hmm. And I'm thinking more people will be dying next episode. Someone always dies. Ugh! I was so mad that they did that to Ned's sword! Ugh! And you already know I was teary over Sansa's grief. That's her best acting to date! Yup, them lovely dragons, I'm still in love with Daenerys and my kid told me that Prince Doran is going to be her match? Oooh I love how she has a penchant for the exotic looking dudes! Those Dorians are hot! I flipped out when I first read about Ned's sword being melted down, especially with one sword going to Joffrey. He's the LAST person who should be allowed to even own a weapon, let alone one with an origin like that. It was just another insult to Ned's memory!